Just a girl with a hammer: My kingdom for a yardboy! I've been scouting hardware store sales and craigslist for a lawnmower all winter. 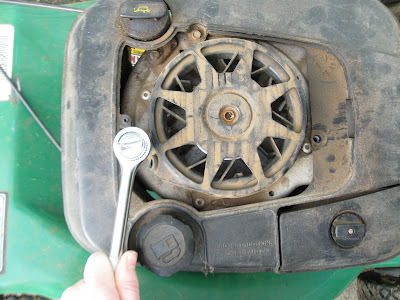 Even used lawnmowers are expensive and how do you tell if a mower is "good" or not? Can you even kick those tiny tires? Somewhere along the way I arbitrarily decided I didn't want to pay more than $40 for a used one. It costs $30 to have a landscaper cut the lawn so if I ended up with a lemon at least it wouldn't be that much more than hiring someone to cut the lawn. 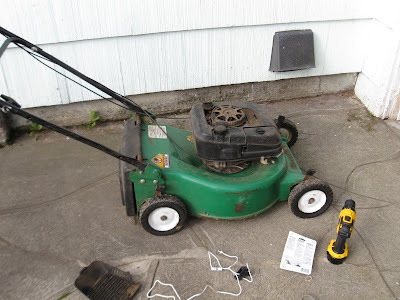 I found a listing for a mower for $40 that was magically still available, so I headed out to Wilsonville yesterday to look at it. When I got there the man explained how he started it up that morning and the starter cord snapped off. Because I'd have to pay someone to install another cord, he wanted to give me the mower for free. I was pretty sure I could fix it myself so I tried to get him to accept my money. We bickered back and forth and he finally agreed to take $10, but "I had to give it to his son" who was standing right there. They loaded the mower into the trunk of my Honda and even gave me an extra bungee cord to keep it in there. These guys were so genuinely nice. I bought a replacement cord at Home Depot for $3.98, bringing the total cost of the mower to $13.98. I started to unscrew things that didn't need to be unscrewed. Then I realized that and put them back together. I almost gave up. I couldn't see a way to get the housing off the top and fiddling with spring-loaded parts that can remove fingers makes me nervous. Then I found this video and it seemed more manageable. I actually didn't have to remove the housing at all. I'm assuming I did it correctly because it works! GO ME. To reward myself for my thriftiness I mowed the lawn, cleaned my gutters, and did some weeding. Seriously though, the surface of the moon has fewer craters than my back lawn. In addition to replacing the fence I really need to rototill the backyard and even it out. And then I think I'd like to get a yard boy. Someone nice to look at who takes care of this stuff for me. I'll make lemonade! I'm sort of overwhelmed by my yard right now, but I'm still floating from the knowledge that for every jerk on craigslist who wants to rip you off, there's a nice guy who cuts a broke girl a deal. Thanks, Terry in Wilsonville. You rock.